In our beauty obsessed world, it can be easy to get carried away with a little nip here and a little tuck there, and then another nip, and another tuck, until some people find themselves looking almost unrecognizable. Overly puffy cheeks, expressionless foreheads and cartoonishly plumped up lips are certainly not the desired effect! In order to avoid the aforementioned disasters, a skilled eye for aesthetics, symmetry and proportions are required. With a holistic approach to achieving these results, LaserTouch Aesthetics boutique medical spa uses the latest technology to enhance its clients’ beauty, by creating subtle and natural improvements. 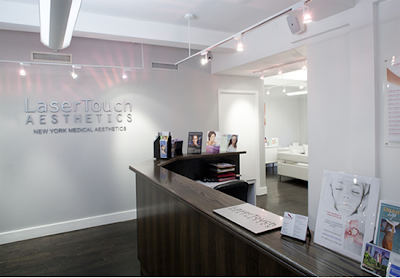 LaserTouch specializes in Botox and Fraxel, and also offers microdermabrasion, oxygen and carboxy therapy, chemical peels, freckle and sun spot removal, cellulite reduction therapy, as well as tatoo removal and laser hair removal. LaserTouch has recently been recommended to me, so if I do try out a treatment in the near future, I will definitely share my experience. I'd probably be most interested in microdermabrasion or chemical peels, which I've both experienced before. LaserTouch is located in Soho at 150 Spring Street, with other boutique locations in Midtown Manhattan and Westchester. You can learn more about LaserTouch at lasertouchsoho.com.